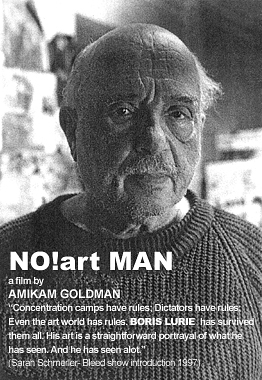 "NO!art Man" is a documentary film about the Russian born artist Boris Lurie, who has lived and worked in New York since 1946. This film is a portrait of one of the most radical minds in the New York art world from the early 1960's. For the most part, Lurie's works are powerful and troubling indictments of man's injustice to man. His photomontages of the late 1950's and early 1960's have been described as the most relevant and shocking images of the period. Today Lurie's images are as strong and relevant as in the time they were made. This film presents an artist who is still considered unknown to the general art audience. Boris Lurie was born in 1924 in Leningrad, Russia and moved to Riga, Latvia in 1925, where he grew up. In 1941, Nazi German entered Latvia. Boris and his father survived four years inside the Nazi camps and in 1946 they immigrated to America. Around 1958, Lurie formed a group of artists that exhibited together in a small cooperative space, the "March Gallery", on 10th street in Manhattan, an area known for the many cooperative galleries around. They put on shows by "themes", calling for political awareness and social involvement through works of art that criticize the culture. This "protest-art" was not accepted by the "American art establishment" of the time. Later, in the 1960's, they came to be known as the NO! Artists.